I made a sacrifice when I bought our new fridge freezer, I decided to go for a slightly bigger fridge and a smaller freezer. I've had to say goodbye to my ice cream maker as the bowl wouldn't fit, but maybe that's for the best. I wanted to make a bit of room in the freezer and I really wasn't using the frozen cauliflower or the frozen broccoli because I tend to buy that fresh. It had to go, so I came up with a plan. Soup. The clearing-out-the-freezer soup plan didn't really work out. The soup was so quick, so good and so nutritious that I now have to make sure I always have frozen cauliflower and broccoli. It's actually become one of our favourite soups and it is a blessing on weeknights when we get home late and I need to throw a quick meal together. The fun part is there is no preparation or chopping. I just throw all the ingredients and the stock into my Vitamix and whizz it up into a smooth delicious soup, then pour into a pan to heat it for a couple of minutes and serve. Voila! If you don't have a powerful blender like mine, leave the frozen veg sitting in the hot stock for a few minutes until it softens slightly before hitting that button. Now I know you are already excited about this soup, but be prepared to be blown away. This soup is very high in Vitamin C and Vitamin A and high in Vitamin B6, but that isn't the best part. Make this soup from supermarket value frozen vegetables and this soup costs just £1.20 for the whole pot, that's just 20p per serving. Now on to the calories. 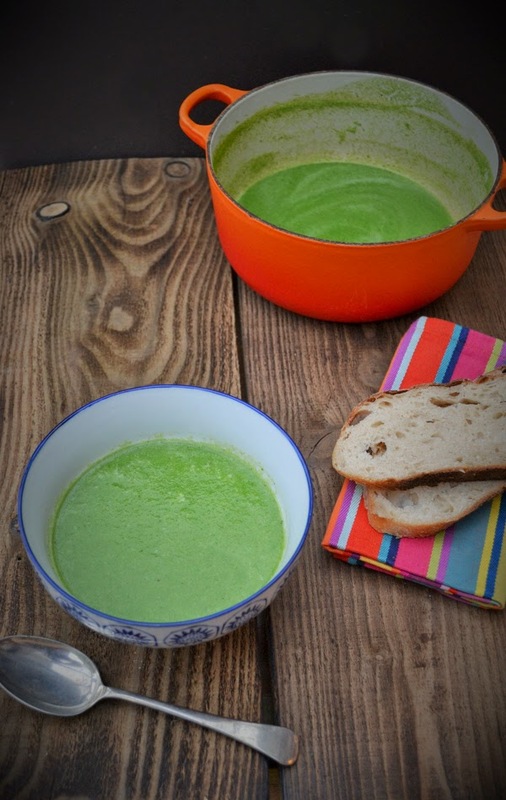 This soup is great for the 5:2 Diet, which I seriously need to do properly again. 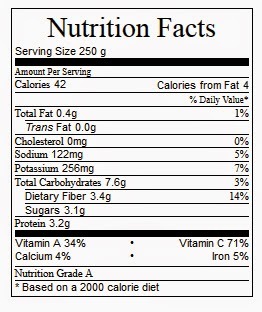 It comes in at only 42 calories per serving (6 servings) or 50 calories for 4 servings. A no prep, quick soup that's packed with flavour and is super healthy. It's one you have to try. It's also a good meal if you are watching your weight or your pennies. 1. Boil the kettle and make up the stock.2. Place the frozen vegetables in a blender or food processor and cover with stock. 3. Whizz to blend into a smooth soup. If you don't have a Vitamix (buy one, no really it will be the best investment you ever make) leave the veg in the stock for a few minutes to soften before you whizz it up.4. Pour into a pan and heat, then season with pepper. It probably won't need salt as the stock can be salty.5. Serve and enjoy! I am entering my soup into 4 challenges. 1. No Croutons Required, a monthly vegetarian soup and salad challenge hosted this month by my co-host Lisa over at Lisa's Kitchen. 2. Extra Veg, a monthly challenge that hopes to help us all eat more veg. Set up by Helen over at Fuss Free Flavours and Michelle over at Utterly Scrummy, but hosted this month by Shaheen over at Allotment 2 Kitchen. 3. Credit Crunch Munch, a monthly challenge to help us watch our pennies. Set up by Helen over at Fuss Free Flavours and Camilla over at Fab Food For All, but hosted this month by Gingey over at Gingey Bites. 4. Family Foodies, a monthly family challenge run by Vanesther over at Bangers and Mash. The topic this month is cheap and cheerful. Haha, I deleted it. That's the kind of thing I usually do. You must have been excited about the soup. It is amazing actually, the flavour is fabulous. I am thinking of clearing out under the stairs and putting a small freezer in there. Well I am thinking of Graham doing, but I haven't told him yet, so keep that quiet. I know, half the cost was the stock cubes. Value frozen veg is really cheap, so great if you're on a budget. Ooh! Cheap and cheerful! I love it! So green! I'll be adding this one to my juice diet! Good! I think you'll like it Genna. This looks so tasty and wonderfully vibrant in colour. I was pleased with the colour. It does make you want to dive in. In a way this soup make up for a small freezer, for while I don't have room to store lots of homemade meals, I can throw this soup together in minutes. I have to say, this is the sort of thing I love for 5:2 - and make infinite variations on. That from a non-smoothie lover - somehow hot soup isn't a smoothie! Haha, well i thought it was more smoothie like, because there was no cooking the ingredients in oil at the start of soup. It was all made in the blender and the veg was raw just in the same way a smoothie is made. It felt like I was making a vegetable smoothie then warming it up. Brilliant, and a great recipe to have on hand! I love quick easy recipes like these. I ought to clear out my freezer actually and might be able to make something like this. Hehe, I know things can be forgotten in there. It's like that back of cupboards, although I am tackling them this week! Delicious, I make a similar one and add some creme fraiche at the end, would bump up the calories though! Fab recipe! Yes, it would bump up the calories, but would be really delicious. I'll remember that when I have guest. Yum! Ahhh well I have to say my fridge is still small, but slightly bigger than the built in one I had before. I could still do with a bigger fridge and freezer, but just don't have the room in my small kitchen. What a beautiful vibrant green - amazing! Also very much loving the budget and diet-friendly aspect of this recipe too... I will be trying this out for sure. Hope you enjoy it. It's a regular in our house now. I may get to the point I make it too much. It is so tempting, Tasty, quick and a great way of getting greens into Cooper. What a great super-speedy super-nutritious super-delish soup recipe Jac!!! I'm 100% going to try this in my new blender. What a lush green smoothie soup. Thank you for linking to the event I'm hosting this month Jac. That's ok Shaheen, it was a good fit for my soup. You are so right, nutmeg is super with spinach. I often add it too. Sounds like an excellent dinner Helen. Yeah definitely, go for it, grated cheese or cream would be good. as a child, i would've turned my nose up at this, but it sounds wonderful to me now! so healthy, so smart, so beautiful! Hehe, it's funny how our tastes and attitudes about food change as we get older. You're right! I saw a Vitamix demo the other day in whole foods and they look amazing! I really want one! This looks fabulous! Such a great colour too. They are amazing. My Vitamix, GHDs and Touche Eclat are my 3 essentials in life. Oh wow, how you turn such simple ingredients into a a dish that looks so tasty! 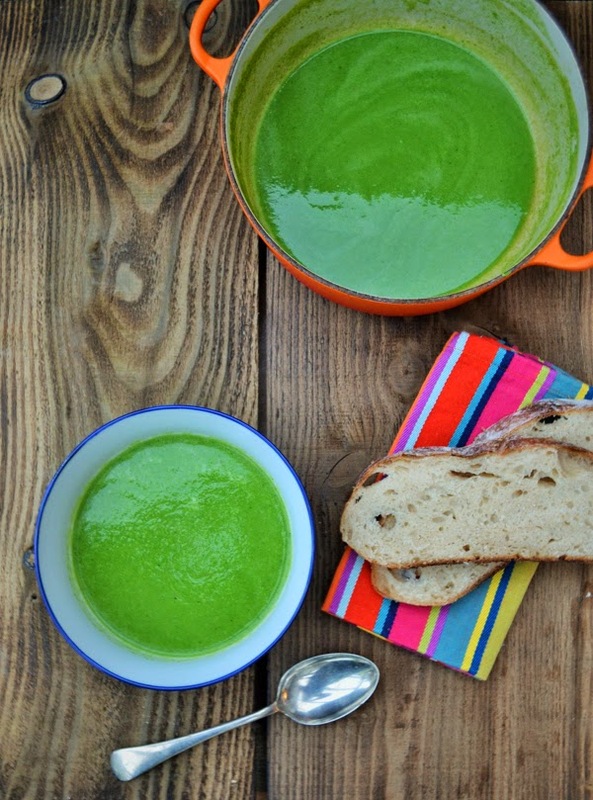 Great idea for a healthy soup - I'll definitely try this! Lovely colour and packed with vitamins - will introduce this recipe to my Vitamix! I think you will enjoy it Ren and perfect for the end of your pregnancy when you are tired and everything is hard work. Nice and nutritious too. I am going to have to try this, as I like the quick and easy aspect of this! Can you store the rest of the soup and consume later days? I usually keep soup in the fridge for 3 days most, if I want to keep it beyond that I pop it in the freezer, although to be honest it never lasts beyond day two.